Notice: (Updated October 2017) Development on FlightLog for iOS stopped a few years ago, but the app has been functional for most users. It appears that Dropbox has stopped supporting the version of their API that is built in to FlightLog, and this is causing users to see a "400 error". If you are currently a user of FlightLog for iOS and are looking for a way to move your data to a different app, then look below for some guidance on how to move your data to CSV. FlightLog has the ability to generate a CSV file and email it to you. CSV stands for comma separated value, and can be viewed and edited in any spreadsheet software (tested with LibreOffice - free). This format is also portable, and other apps often can import this type of archive. The "Generate Report" feature can be found in the main menu. When you select to generate your report, you can choose a readable / printable HTML based report or a CSV based report. Simply select the CSV report. If for some reason the CSV generation process fails, the HTML report generation should still succeed. Go ahead and create the HTML report. With this file open in any web browser (or even your email client) you can select and copy all rows of data in to a spreadsheet. The spreadsheet software should put the fields in their own colums just like the CSV generation process would have. The thing to remember when putting together your own CSV file in this way is that you should have a single row of column headers on top and the rest of the rows should be data rows (no total or grand total rows). If you continue to have trouble creating the CSV file then feel free to reach out for assistance. FlightLog is an iOS native app to help pilots manage and analyze their flight time. FlightLog started life as a rudimentary logging app. 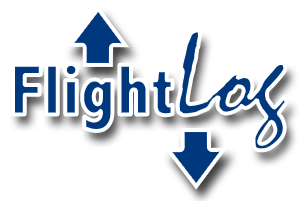 Over time and with feedback from dedicated users FlightLog has grown in to a powerful tool for flight time management and analysis. The app is designed to keep your logs well organized; The home screen allows you to see summaries of your total flight time for each "Aircraft" group, as well as giving you quick access to detailed totals, a list of all of your logs, or even just the logs for a specific "Aircraft" group. The Query Builder allows the user to get a report of flight time that satisfy a set of rules that user selects from a list. For example, lets say you want to know how many hours you have flying a single engine propeller aircraft, with a glass cockpit, more than a 50 mile trip, at night, as a pilot in command, and in the last 30 days only. A user can tap out this query quickly and get the answer within seconds! Another example would be to quickly see how many hours you have logged in the past 6 months as the pilot-in-command on cross-country flights at night! These are just two examples of queries the user can create. Any log criteria can be used to create your own queries! You can even create reports of your queries and save the to Dropbox or send them to your e-mail! Data backup done right! A new update to FlightLog brought with it data backup capabilities that integrate with Dropbox. This integration allows you to backup your data to the cloud and recover it back on any device running FlightLog, even an iPad! Data backup to the cloud is a free feature for all FlightLog users. Create your free account at Dropbox or even from inside FlightLog! FlightLog also has an Report Generation tool that lets you customize the fields, order, and other information you would like a report generated for. This report is either e-mailed to you our placed in your Dropbox for printing or keeping. FlightLog is flexible in that you can enter and display time in either decimal or HH:hh format. Please feel free to read the reviews of my other iPhone app, "FlightPlan", and see what people are saying. Suggestions and comments are taken very seriously and customer satisfaction is paramount. Thank you for your interest in this software. If there are features you would like to see in the future, please contact me! Also, visit the website for more information, screenshots, to browse the user guide, and access to the forums. The Query Builder allows you to analyze your log totals by a combination of custom criteria you choose. Quickly see how many hours you have logged in the past 6 months as the pilot-in-command on cross-country flights at night! This is just one example of many queries you can rapidly build with the query builder that was introduced in FlightLog 1.1.0. This feature allows you to generate a report of your flight time and either e-mail it to yourself or place it in your Dropbox account. Reports can be generated containing all of your flight time or even reports of the queries you build! Easily enter previously obtained flight time. Get it from the iTunes store! Please Note: FlightLog should be used as a supplemental tool to manage and analyze your flight time. It is recommended that you also maintain hard copies of all of your logged time to prevent loss should data corruption occure.